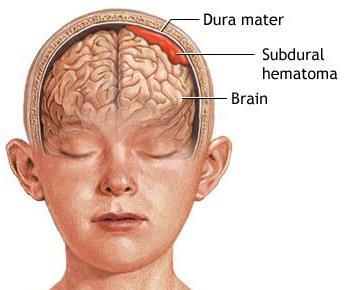 A chronic subdural hematoma (SDH) is an old clot of blood on the surface of the brain beneath its outer covering. These liquefied clots most often occur in patients age 60 and older who have brain atrophy, a shrinking or wasting away of brain tissue due to age or disease. When the brain shrinks inside the skull over time, minor head trauma can cause tearing of blood vessels over the brain surface, resulting in a slow accumulation of blood over several days to weeks. Because of the brain atrophy, the liquefied blood clots can become quite large before they cause symptoms. 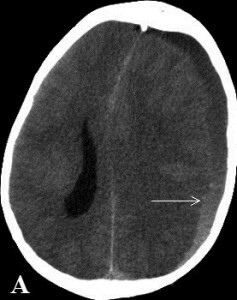 Less than half of patients remember the traumatic event itself because even relatively trivial trauma, such as a minor bump on the head, can produce these slow hemorrhages. Other risk factors include alcohol abuse, seizures, shunts that drain excess cerebrospinal fluid from the brain, and blood thinning medications such as Coumadin. The most common complaint is headache, seen in up to 80 percent of patients. Other symptoms include lethargy, memory impairment, confusion, weakness, nausea, vomiting, impaired vision and seizures. Patients with large hematomas may develop varying degrees of paralysis and coma. 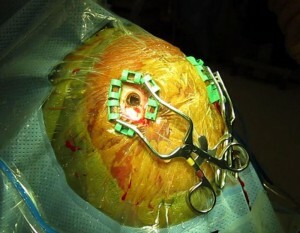 A chronic subdural hematoma may mimic a number of other brain disease and disorders, including dementia, stroke, temporary disruption of blood supply to a portion of the brain (transient ischemic attacks), encephalitis and brain lesions such as tumors or abscesses. Diagnosis involves computed tomography (CT) and magnetic resonance imaging (MRI) brain scans. SDHs vary in density and may extend over a large portion of the surface of the brain. An initial misdiagnosis of dementia is particularly common in elderly patients where symptoms involved a steady decline in overall mental function. An errant diagnosis at the time of hospital admission occurs in up to 40 percent of cases. Patients with chronic subdural hematomas that produce symptoms are effectively and safely treated by drilling a hole in the skull and draining the blood mass through a catheter. This procedure can often be performed at the patient’s bedside rather than the operating room. Recovery after brain injuryvaries widely. Overall, 80 percent to 90 percent of patients have significant brain function improvement after drainage of a chronic SDH. Residual fluid may collect after treatment, but improvement of symptoms does not require complete removal of the fluid.